WineEmotion is really excited about its first few months of launch campaign in the UK marketplace – we are offering a wonderful product that’s innovative, increases wine profits and is beautifully designed and manufactured to the highest quality – and believe it or not all of this comes at a very competitive price. In June we carried out our first WineEmotion UK installation at A Taste of Tanners, the new wine shop at Tanners Wine Merchants in Shrewsbury. It was wonderful to see the staff’s reaction at the new dispenser – I think ‘elegant’, ‘beautiful’, ‘so clever’ and ‘can’t wait to use it!’ were the most common expressions we heard throughout the day as word spread like wildfire through the Tanners offices of the new eagerly awaited arrival. We may be a youthful new entry in the UK but our foundations lie rooted in wine dispensing history, with the original pioneering team that created the first wine dispensing system now running WineEmotion from our Italian factory. It’s exciting times in the UK wine dispensing market, WineEmotion brings a new fresh approach to the off and on trades and we can’t wait for you to join the WineEmotion family! 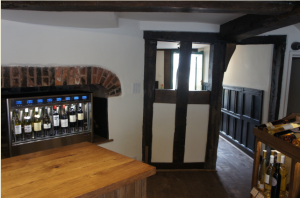 Read our latest case study on Tanners Wine Merchant by clicking here.